Skills First subsidised places are available. 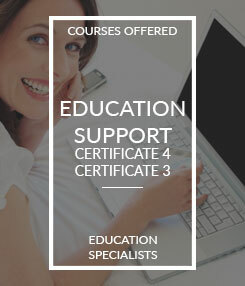 To see if you qualify for an Education Support qualification enquire now. Already Employed at a School? 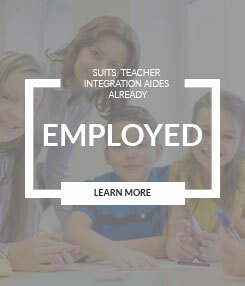 Our Integration Aide Courses are designed by teachers specifically for Teacher Aides already employed in schools. 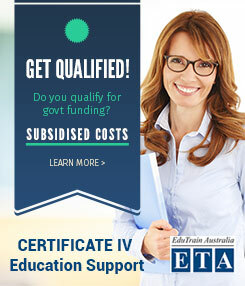 EduTrain Australia (ETA) is a Registered Training Organisation (RTO) established in 2002. EduTrain Australia delivers education support qualifications including Certificate IV in Education Support CHC40213 to Teacher/ Integration Aides who are currently working in a school and are looking for a professional development opportunity to update their qualifications. The course has been customised with the experienced Teacher Aide in mind – a course that is written by teachers specifically for currently employed Learning Support Officers (LSO). Delivered at convenient locations across Melbourne, students have the opportunity to learn with other Teacher / Integration Aides from other schools. Find out how you can complete the Certificate 4 in Education Support CHC40213 with EduTrain Australia by calling 0419 150 272. Read more testimonials from people just like you who have attended our courses.